Planting a winter garden in a temperate state like Tennessee allows for extending the growing season for some types of hardy vegetables. Certain steps must be taken to protect the plants and ensure proper growth during the cooler season. Some vegetables enjoy cooler temperatures and do better in cold, even surviving mild freezing. Knowing which vegetables to plant for winter crops will ensure success and your harvest will prove that even winter can provide a garden full of ready-to-eat vegetables. Remove debris and spent plant material from summer vegetables in very late summer to early fall. When summer crops are finished producing, remove the plants to make way for additional plantings rather than allow them to remain in the garden. 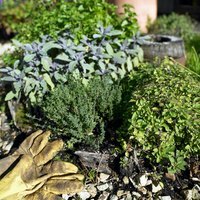 Add compost to the soil to prepare for new plantings. Compost and fertilizers should not be added later as cold temperatures reduce effectiveness, so all soil amendments should be added now when the soil is warm. Plant cabbage, collards, beets, beans, snap peas, turnips, broccoli, radishes, kale, Brussels sprouts and cauliflower in August for early winter harvests. Sow lettuce, spinach, carrots and onions in September. If warm temperature persist, be sure lettuce and spinach are planted in a shaded area until cooler temperatures are reached. Water the fall garden if rainfall does not reach adequate amounts. Winter beds tend to have dry conditions, so be sure your garden is watered regularly. Harvest the mature vegetables when they have reached their peak. If a heavy frost is forecast and not all the vegetables are mature, a quick protective measure will keep most of them from damage and let them continue to ripen. Use a thin plastic drop cloth as a cover when this occurs; simply lay over the plants until the frost has burned off. Be sure not to leave the plastic on the plants in full sun as the opposite effect may occur and the plants could be burned. Plant lettuce and spinach year-round in a cold frame if you choose. The cold frame keeps the heaviest frost and freezing from claiming the plants and they can often overwinter until spring and continue to produce. Some vegetables such as Brussels sprouts may overwinter in the garden without use of shelter and still have fruit to harvest in the spring.